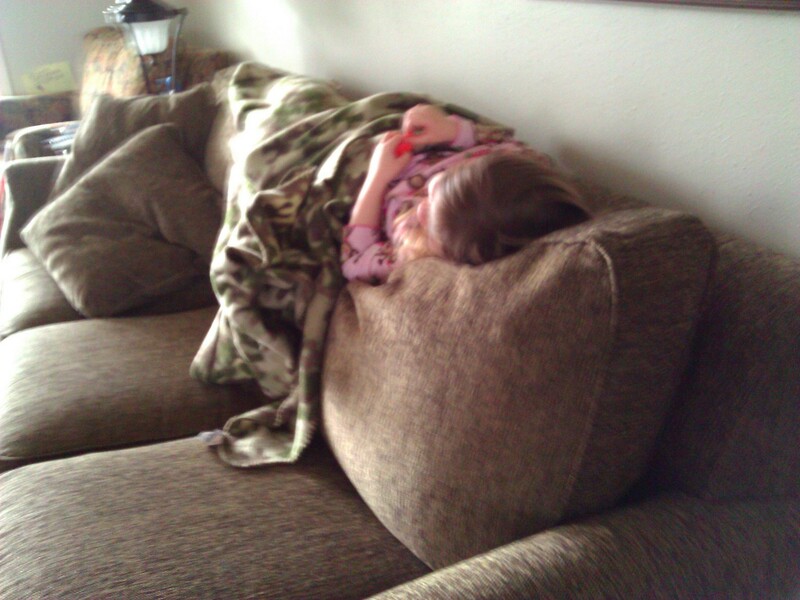 So, begins day 3 of her captivity because of the ice storm. It’s not terribly bad here but if I don’t have to take her out on the roads, I just figure why bother. Sheldon went into work this morning and because we park our cars outside it took no joke-30 minutes of scraping to get all of the ice off his truck. I think it was between 1-2 inches thick. That is good times! I’ve made these many times omitting the butter completely. In that case, just increase your applesauce to one cup. The cookies will have more of a cakelike texture but they are still awesome. I’ve successfully included chia and/or flax seeds without any complaints from The Blueberry…In fact, I think we’ll be adding 1/4 to 1/2 cup of flax seeds today. Because I’m adding the flax seeds, I’ve decreased the oats by about 1/2 cup. If you haven’t yet discovered either of these seeds, I STRONGLY recommend that you check them out. The health benefits for these seeds are just phenomenal and they can be snuck into all kinds of baked goods. The chia seeds have a bit of a slimey texture in some wet applications, so I probably wouldn’t add them to eggs, but hiding them in cookies, cakes and crackers-super genius! Preheat your oven to 350. Cream together butter and sugar until it looks fluffy. Beat in eggs one at a time and then add vanilla-this becomes your wet mixture. That’s not dirt on my mixer, I forgot and added the cinnamon early while the mixer was on. Not. Genius. In a separate bowl, mix together your flour, salt, baking soda and cinnamon. Then incorporate this into the wet mixture one cup at a time. 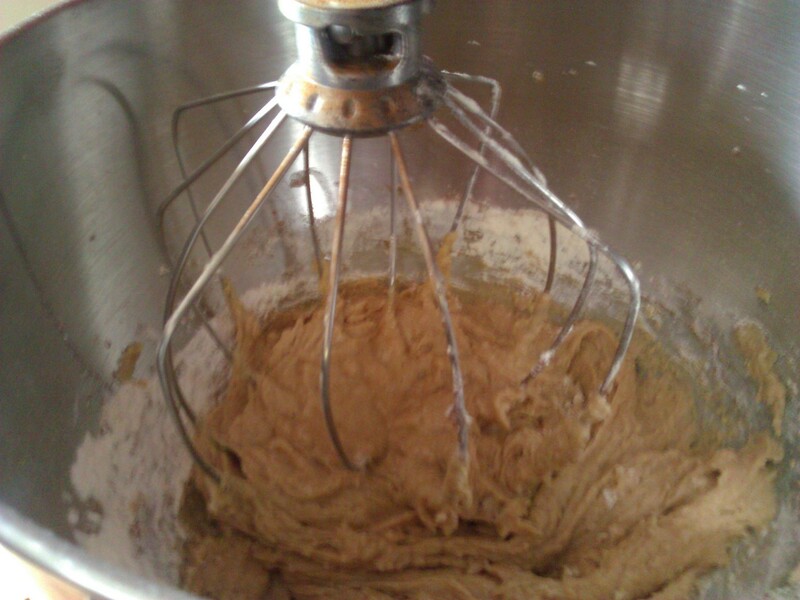 You don’t want to overmix it because flour will begin to form gluten which can make cookies a bit too tough. 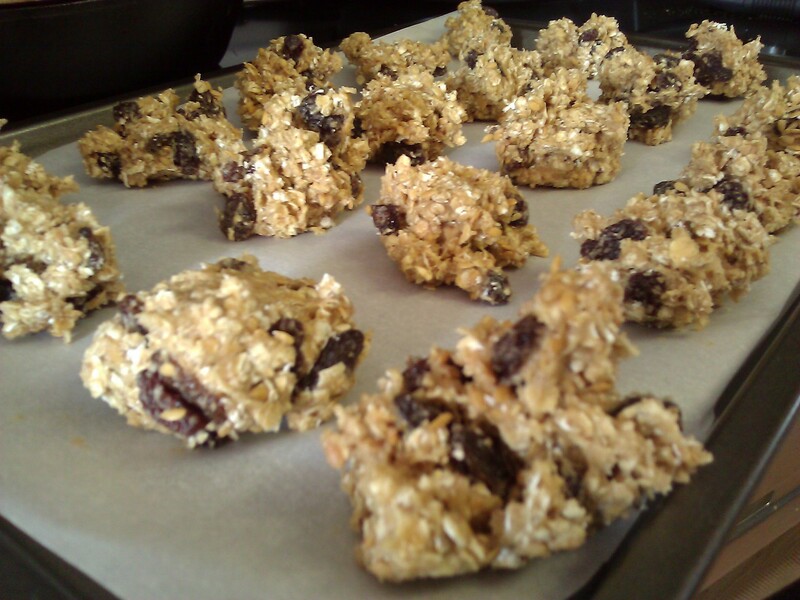 Once your flour mixture is in, mix in your oats and dried fruit by hand until incorporated. I then use the 2 spoon method to drop them on to a baking sheet lined with parchment paper or silpat. I like big cookies and I cannot lie.. They don’t spread out, so pretty much how you plop them onto your sheet is how they come out. Bake for 8-12 minutes depending on oven. If you omit the butter, they won’t get terribly brown, so try a small first batch to see how long you really need to cook. Let cool on a rack and then stuff them in your face. According to Calorie Count, it’s about 41 calories per cookie with sugars and fats both under 9 grams respectively (fat under 2 grams) Adding in the flax seeds adds some fat but it also adds a very nice amount of protein and fiber, so while it is not quite like eating a celery stick, it’s still healthier than eating a full fat cookie. At any rate, I can’t blog any more because I need both hands free to shove em in. Happy baking! 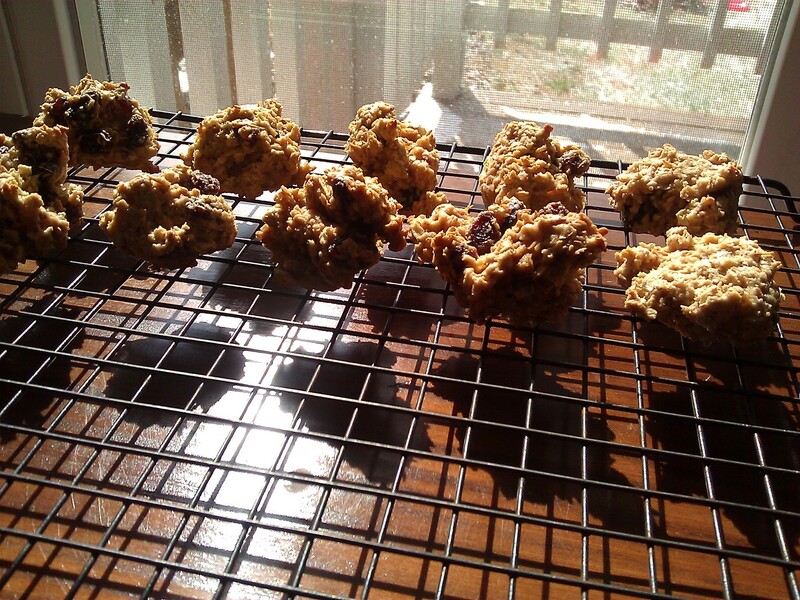 Posted on February 22, 2013 by BAFarm	• This entry was posted in baking, Giving up store bought, Kids, Sneaking healthy foods in and tagged baking, baking with kids, chia seeds, flax seeds, healthy oatmeal raisin cookies, oatmeal raisin cookies, reduced fat baking. Bookmark the permalink.